Today, the United States Mint began sales of the Medal of Honor Commemorative Coins. The Medal of Honor represents the highest award for valor in action against an enemy force that may be bestowed upon an individual serving in the U.S. Armed Forces. Authorized under Public Law 111-91, the program is intended to recognize and celebrate the establishment of the Medal of Honor in 1861, honor the military men and women who have received the award, and promote awareness of the Medal of Honor and what it represents. The United States Mint is authorized to issue a maximum of 100,000 gold coins and 500,000 silver dollars, across proof and uncirculated versions. This is one of two commemorative coin programs authorized by Congress for the year. 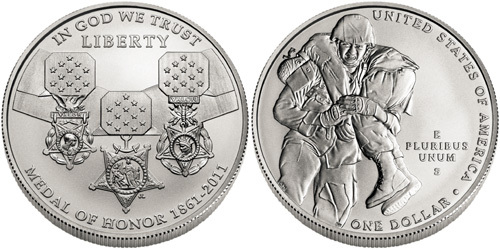 The United States Mint previously released 2011 U.S. Army Commemorative Coins on January 31, 2011. The obverse design of the gold coin features a depiction of the original Medal of Honor authorized in 1861 as the Navy’s highest personal decoration. The reverse of the Medal of Honor $5 Gold Coin features Minerva, with a shield representing the Army and Navy in her right hand and Union flag in her left hand. In the background is a field artillery cannon and wheel of the Civil War era. The obverse was designed and sculpted by Joseph Menna, while the reverse was designed by Joel Iskowitz and sculpted by Michael Gaudioso. Each gold coin is struck in 90% gold and 10% alloy. The diameter is 0.85 inches and the weight is 8.359 grams. Gold content is 0.242 troy ounces. Pricing for the coins is $449.95 for the proof version and $439.95 for the unicrculated version during an introductory period. After March 28, 2011 at 5:00 PM, pricing will be $454.95 and $444.95 for proof and uncirculated coins, respectively. The Medal of Honor Silver Dollar depicts the current Army, Navy, and Air Force Medals of Honor on the obverse of the coin. The reverse contains a scene of a contemporary infantry soldier carrying a wounded solider to safety under enemy fire. The image is intended to show the courage, selfless sacrifice, and patriotism of recipients of the Medal of Honor. The obverse of the silver dollar was designed and sculpted by Jim Licaretz, and the reverse was designed by Richard Masters and sculpted by Phebe Hemphill. The coins are struck in 90% silver and 10% copper. The diameter is 1.5 inches and the weight is 26.73. Silver content is 0.7736 troy ounces. Introductory pricing for the silver dollars is $54.95 for the proof version and $49.95 for the unicrculated version. Regular pricing after March 28 will be $59.95 and $54.95. The prices charged by the United States Mint reflect a surcharge of $35 for each gold coin and $10 for each silver coin. As specified by the authorizing legislation, these amounts will be distributed to the Congressional Medal of Honor Foundation to finance educational, scholarship, and outreach programs. I’m excited about this MOH commemorative! I purchased the gold coin in proof and can’t wait to see it. I’ll have to be patient as it’s not expected to ship until April the 28th, I think.